via Spokane Public Market closing | KREM.com Spokane. It [SIRTI] was always about a sales pitch. I recall one meeting when a former EWU president announced the latest “innovative” idea: It “promised” to create a new “high-tech” (it always had to be “high-tech”) company that in, say, five years would generate (pick a number) in revenue and (pick a number) new jobs. No evidence, just numbers, seemingly pulled out of a hat. We’ve written a lot about SIRTI on this blog. Take a look. Shutting down this former funding gatekeeper would be a good thing. As a former Board member said, SIRTI did more to hinder economic growth than anything else. “Spokane’s red-light cameras make streets safer, statistics show” – No they do not. While there are fewer collisions, the data are insufficient to say that red light cameras played a role. The day this article came out, this blog had a lot of visits. I guess visitors sought data so here is a little. The news report itself is excellent. State wide, and in the city as a whole, collisions are down. Obviously, the reduction in collisions is real but since big reductions occurred city- and statewide, we cannot yet conclude that a small number of red light cameras were the cause of the reduction in Spokane. 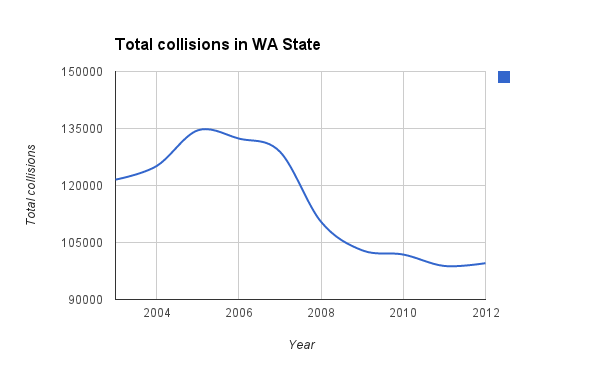 In fact, the reduction in total collisions in Washington has been going on for quite some time. The data for this chart comes from the State of Washington. Their various annual reports often change prior year numbers slightly as new data came in; consequently, depending on which data report provides the numbers, the curve may vary slightly from this. That site also has total collision counts for Spokane County and the city of Spokane, but I did not have time to deal with all the data. It may be hard to prove that red-light cameras are behind the reduction in collisions. In the same five-year period, crashes have declined across the state and in many jurisdictions, even those without red-light cameras. via Spokane’s red-light cameras make streets safer, statistics show – Spokesman.com – Jan. 26, 2014. Council members no longer deny that revenue is an attractive part of the program. Many point out that nearly half the tickets have been paid by drivers who live outside city limits, essentially making the program an opportunity to tax drivers who use city streets but haven’t paid for them. Between 2009 and 2012, the state averaged 425 crashes that resulted in fatalities and about 2,000 crashes that resulted in serious injuries each year. Those numbers are down 23 percent for fatality crashes and 16 percent for serious injury crashes compared to data from 2004 to 2007. And the Spokesman-Review included nice charts with the story – good job!